1 – The games are as random as humans can program a computer to be. It doesn’t matter whether you’re playing a three-reel game or an up-to-date video slot with half a dozen different bonus events. Results are determined by a random number generator (RNG), and what you see on the reels or screen is just a user-friendly interface to display the game being played out on the RNG. It doesn’t know how much you’ve wagered, and it has no record of past results. 2 – The games make money for the casinos by paying less than true odds. In that respect, slot machines work just like other casino games. In double-zero roulette, for example, the true odds against winning the bet are 37-1, but the house pays winners only 35-1. 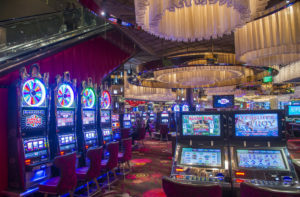 Slot machines have many more possibilities, and the odds are different from machine to machine, but the principal is the same. Whether your winning combination is three bars, five Eyes of Horus or any other of the millions of possibilities spread among thousands of games, the amount you’re paid is less than the true odds of winning the bet. 3 – Games with lower-denomination bets almost always give lower payback percentages than games at higher denominations. Even in the video age, where multiple pay-lines means penny games can have $5 maximum bets that exceed the traditional $3 on three-reel dollar slots, $5 slots give a higher percentage back to the player than $1 slots, which pay more than quarter slots, which pay more than nickels, which pay more than pennies. 4 – Your chances of hitting a large, lifestyle-changing jackpot are greater on reel-spinning slots. Three-reel slots, especially those with a single pay-line, are designed to be more volatile than five-reel video slots. You have many fewer winning spins on the reel-spinners, but nearly all of them are for at least several times the size of your bet. On video slots, more frequent small wins are a big part of the overall payback. Three-reel slots put more of their return into bigger hits. If you’re playing a three-reel slot, you’re more likely to hit a big jackpot than on a video slot, but you’re also more likely to lose your money quickly. Which experience you want is up to you. All those small paybacks do add up, and help keep you in your seat longer on video games. 5 – Video slots with pick-em bonuses usually stretch your playing time more than games with free spin bonuses. When video slots first rose to popularity in the late 1990s and early 2000s, they were mainly concentrated on nickel games. A prime attraction was time on device they kept you in your seat longer than three-real games, and one of the ways they did it was with pick=em bonus rounds. A big win might be 100 or 200 credits, but that wasn’t bad. A 200-credit win was worth $10 on a nickel machine. But when penny games came along, designers had to find a way to pay bigger bonuses. A 200-credit bonus is only $2 on a penny game. There was a need to offer prizes worth playing for. The dominant method has been free-spin bonuses. You might win thousands of credits on free spins. You might also win nothing. Itâ? ?s the possibility of nothing that makes the thousands possible. 6 – Players should never play a progressive slot machine without making the wager necessary to be eligible for the progressive jackpots. On progressives, a percentage of wagers are added to the jackpot, or spread across multiple jackpots on many modern games. On three-reel slots with single jackpots, you usually have to bet maximum coins to be eligible for the jackpot. On video slots, you’ll sometimes be asked to make a separate bet to be eligible for the jackpots. Just keep in mind that progressive games put a larger percentage of their overall return into the jackpots, and usually pay less on the base games. 7 – On games with mystery jackpots, those who bet more credits per line have a better chance of winning the jackpot. Some progressives don’t require max coins bets, nor do they require separate wagers to be eligible. Players who bet minimum coins per line are playing for the same jackpots as those who bet the max. On such games, the jackpot isn’t triggered by a combination of symbols on the reels it’s just launched as a complete surprise to the player, even sometimes after losing spins. These are mystery jackpots, and it’s a mystery how you win. One common method is for a random number generator to select a jackpot amount. Then the player whose bet pushes the jackpot to that level wins it. If you bet more credits, your bet pushes up the jackpot by more cents, bringing you more chances to win. Without such programming, casinos couldn’t offer the same pot to players betting different amounts. 8 – Always use a players club card when you play. Per dollar played, slot players get more comps and free play than table games players. You can’t overcome the house edge, but you can take everything the casino will give you. Don’t increase your bets for the sake of comps, but if you play your normal amount and the casino buys your lunch and gives you a few bucks in free play to boot, so much the better. 9 – Take advantage of double points days. You can’t overcome the house edge with slot club freebies, but you can narrow the gap a bit with a little smart play. Let’s say your normal amount of play brings you $5 in free play. On a double points day, you’ll get $10 instead, or $15 on triple points days. Every little bit counts, and if you know a multiple points day is coming up, you might think about timing your trip to take advantage. 10 – Watch for opportunities in promotions. It’s sometimes possible to improve your chances of winning at promotions with a little smart play. For example, if a casino schedules a lucky seat day in which each hour it awards $100 in free play to a player at a randomly selected game, your timing can make a difference.